One of the things that I am always amazed about is the generous nature of the comic book community I am part of here on social media. Every so often there'll be package awaiting me when I get home from work from a comic of blog friend I have made here. And I do my best to return the favor when I can. #topsecretproject is always a favorite part of my con season, getting books signed for friends. This Christmas season I got a fantastic package from great friend Russell Burbage, the founder and curator of the Legion of Super-Bloggers. Russell helps keep my on track on that site as I maintain 'Fridays with Anj' there. The package had two pieces but I'll be covering them in separate posts. 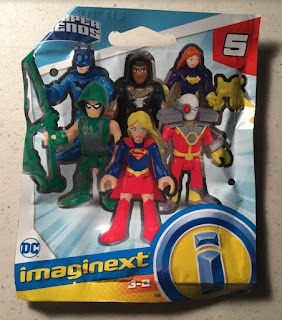 First off, I got the Supergirl figure from the Imaginext Series 5 line. I cannot tell you how happy I was to get this. I see these mystery figure toys all the time. 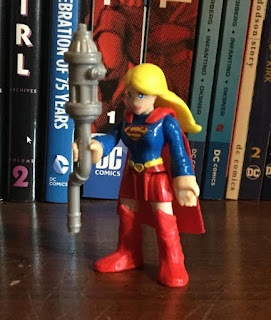 There is often a Supergirl or Streaky figure that I would love to own. But I just can't gamble like this. Imagine if I ended up with 6 Green Arrows and no Supergirls? So I never pick these up in their raw form. So to have Russell open up a pack, see Supergirl, and think of me was a wonderful. Merry Christmas to me! Now this is a great little figure. 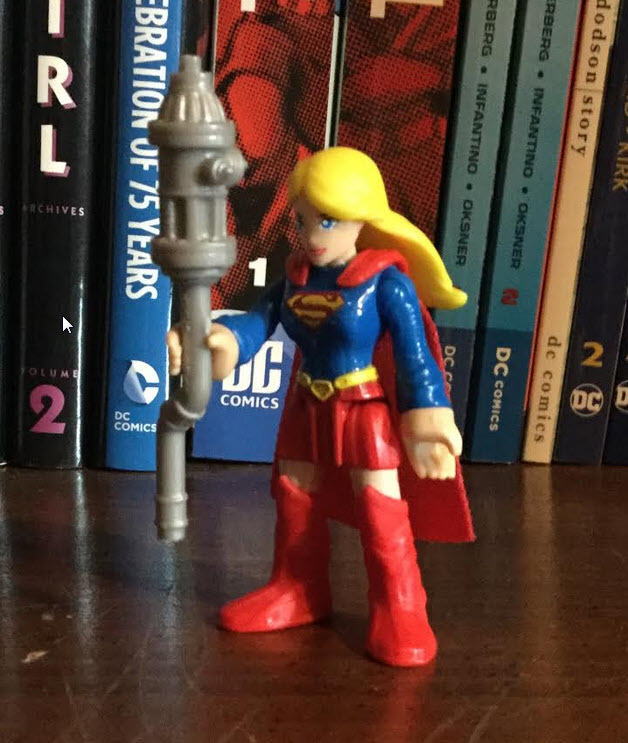 As folks here know, I am all in for the red skirt version of the Supergirl costume. So I love this. Everything kind of works here. The high boots. The long hair. The sort of cartoonish face. It all makes this a great figure. I don't know if I completely understand the inclusion of a sort of war hammer. But there it is. I also can't help but think that the top of the war hammer looks like a fire hydrant. Were these things supposed to represent something? Or was it random? 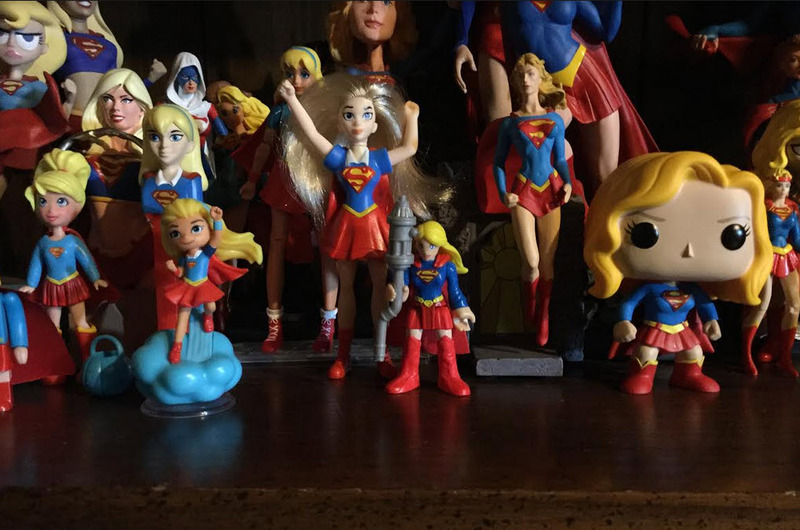 The figure has found its home on one of the shelves of the shrine, right there with the DC Superhero Girls and the Matrix costume figures. Thanks again Russell! Such a great little figure to add to my collection! "I also can't help but think that the top of the war hammer looks like a fire hydrant." I THOUGHT it WAS a fire hydrant. With a piece of piping still attached to it. Are you sure it is a war hammer? Maybe it is supposed to be a fire hydrant which she ripped off during a fight to bludgeon/tie up someone with. Regardless that, it's a cool figure. I like the red skirt, although I'm less fond of the "S"-belt buckle. I suppose it could be a hydrant after all. Seems weirder than a hammer? Great collection of supergirl figures! 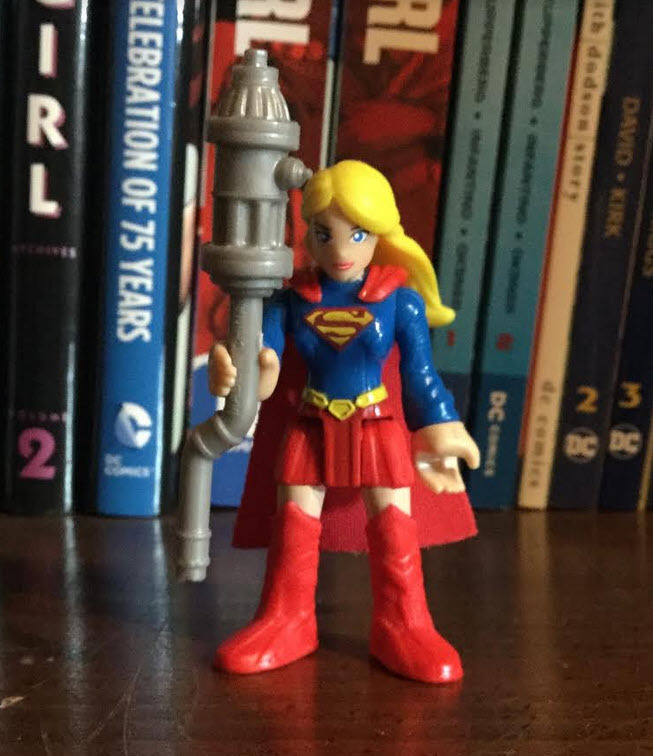 I just stumbled on a 2.5" plastic Kinder Surprise Egg DC Super Hero Girls Supergirl Mini for sale on eBay that was very inexpensive and is great (I think). 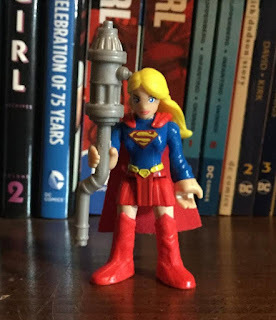 Goes well with all the other tiny figures (like the New 52 Nano Metalfig). You never now what's out there! There's a surprising amount of DC Super Hero stuff out there considering it's a YouTube short that's been cancelled. And yeah, that's definitely a fire hydrant! And now we know for the first time what the pipes look like underneath a fire hydrant. But what the heck is Green Arrow holding in the picture - a bow that is twice his own height? Makes more sense than a fire hydrant, I guess. Yes, that IS a fire hydrant she's holding. eBay is a good place to pick up those mystery box figures. I bought a Mystery Mini Streaky last year for retail price from an eBay seller. Now this is off topic, but if you'd like to see Stanley (ArtGerm) Lau actually draw Supergirl, there's a new video on DC's YouTube channel. The video was put up yesterday, January 16 (I'm writing this early on the 17th). ArtGerm sketches Batgirl and Supergirl and answers some questions. He mentions that he had planned to do 6 retro type Supergirl covers, but was cut short when the book was stopped. The title of the video is "DC Comics Art Academy Featuring Stanley "ArtGerm" Lau". Glad you didn't already have her!